I was asked to go to the Sweetwater Festival and do a spinning demo for the attendees. Its not really a demo demo... its me sitting and spinning and talking to those who are interested. I also get to take some items for sale. I am really thrilled to have the opportunity, though I am a little scared since my knees are swollen and the whole point is spinning. 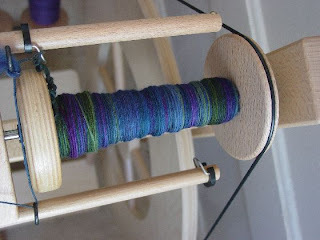 I will be taking my top and bottom whorl spindles but I have been having some severe wrist and arm pains. It's like I am slowly falling apart. Maybe if I just switch between the two of them I can make it the day. Just a show of what I have been spinning this week. I took a trip to a new store in Decatur called Sheepish. It had these great roving colors and I couldn't resist getting it. I met the owner of the store as well. She was friendly and knowledgeable. Isn't that how we all like our store owners to be. =D I'll blog about that more later this week.